I love all things Denim!! One of my favourite magazines, Harpers Bazaar is now online-whilst browsing their website, I came across this fabulous feature on denim. I adore all types of jeans-skinny, slim, flared, bleached, bootcut, white, cropped, cut offs are all my thing. I also love denim jackets- I have two- my faded cropped River Island jacket, bang on trend for this summer and my Jean Paul Gaultier Jeans jacket above, which has lovely pictures all over it -a lovely vintage piece that I adore. I love this bikini/jacket combo!! This Christopher Kane skirt really rocks!! 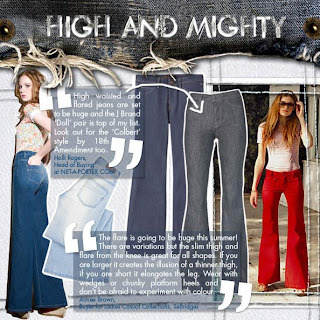 I love the high waisted jeans look-very 70s!! White and Bleached never seem to go out of fashion!! I so want a denim romper to just chill around in during the summer. Hi Siljes! 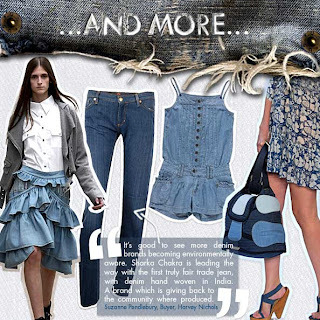 Yes, it's nice to see denim never goes out of style- I love a lot of these items featured!! Hi Wendy-go for it! All in ones are so hot for this summer! I hate you! Why do you have this jacket and I not?!?? No, don't be afraid. I'm just pulling your leg. The jeans jacket is perfect and I love it. Ha ha Charlotte! I know you don't hate me really-thanks for that!! I love denim too - all kinds, all colors, all shapes! And those shoes are simply fabulous! Hi ida-thanks for visiting me!! I agree, you can never have too much denim!! That denim romper in one of the pictures is very cute. I'm loving my jean jacket this spring. Hi fashionable obsessions-thanks for stopping by my blog! The romper is very cute! I agree, denim jackets are so hot for this summer! I adore the denim jacket - it's different and outstanding. I would like to wear it ;). Oh thats so kind, Nadine-thanks a lot! It's definitely a wardrobe favourite of mine!